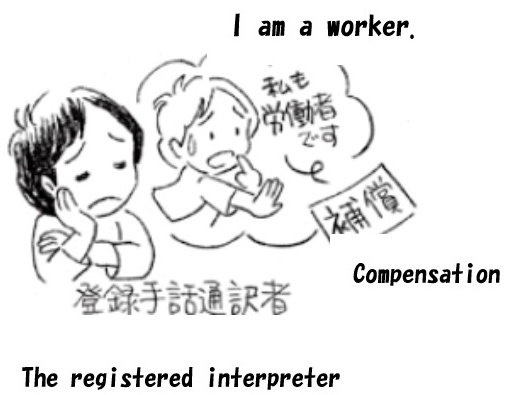 The Japanese Association of Sign Language Interpreters (JASLI) was established three years after the initial "Sign Language Interpreting Skill Certifying Examination" was first administered in 1989. The aim of JASLI is a continuous contribution to the sign language interpreting system through the enhancement of sign language interpreters' performance and the improvement of specialist skills. JASLI has tackled various issues since its establishment. JASLI formulated "The Ethical Guidelines of Sign Language Interpreters" in 1997 and has striven for the enlightenment of the public as to the social value of our profession, and to heighten the social value of a sign language interpreters' organization as a professional body and broaden the appreciation of its high qualifying standards. Over time, the social circumstances surrounding JASLI has changed. "Act for Resolution of Discrimination of Persons with Disabilities" was enacted in 2013, and Japan ratified "Convention on the Rights of Persons with Disabilities" in 2014. The actualization of a society where both people with and without disabilities live together hand in hand, is surely attainable. As we continue to diligently make efforts to improve the rights of all citizens, the importance of the role of the professional sign language interpreters will be realized by society as a whole. As a professional group, JASLI pledges here to promote fundamental human rights as defined in "Convention on the Rights of Persons with Disabilities"; it pledges to work tirelessly for the deserved appreciation of its high qualifying standards by an informed public; and it pledges to work in conglomeration with the many and varied organizations related to its services. 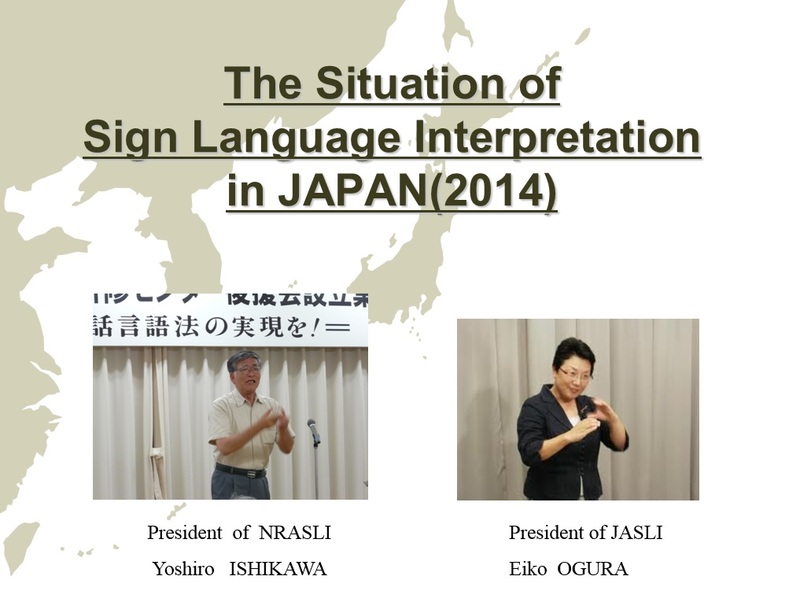 The Japanese Association of Sign Language Interpreters (JASLI) was established in 1991 by sign language interpreters (SLIs) all over Japan aiming to improve the quality and the professional skills of SLIs and to contribute to the development of sign language interpretation services and systems in Japan. As a professional organization, JASLI has held annual conferences to share the experiences and skills of SLIs since 2003, publishing its proceedings. 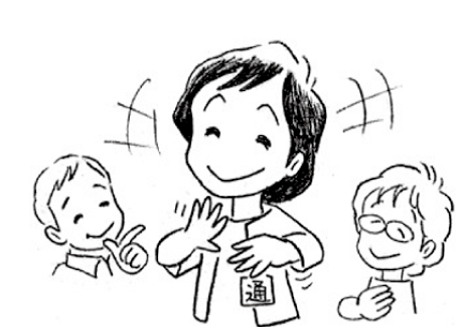 JASLI created the Ethical Guidelines of Japanese Sign Language Interpreters in May 1997, acknowledging its importance to serve as a basic guideline for professional SLIs, whose work deals with the issues of life, property and human rights, to establish credibility and to work without influences from any social circumstance discrimination-free. It was also expected that, with this Ethical Guidelines of SLI, JASLI could raise its profile and gain recognition as a professional organization. As the Ethical Guidelines of SLI defines the standards of conduct in all sign language interpreting settings, every SLI with or without certification is expected to adhere to its standard. In order to raise awareness about the Ethical Guidelines of SLI among relevant parties, JASLI published and distributes a booklet called "Ethical Guidelines of Sign Language Interpreters for Everyone". The Sign Language Interpreter Certificate Examination (SLICE) has been administered since 1989. This contributes to the career paths of many qualified professional SL interpreters who are now playing important roles throughout the country. 7) The publication of " TUBASA(Wings)" −the JASLI Newsletter. Sign language interpreters need to possess a broad spectrum of social skills, have an understanding of a wide variety of subjects, besides, of course being adept at interpretation because their role is to help people who have difficulties in communicating with the hearing community. During the actual situation of interpreting, an interpreter has the important task of being the only person who knows the opinion or ideas of both sides of the conversation. The Sign Language Interpreter Certificate Examination (SLICE) aims to ascertain that the applicant has sufficient technical skill and knowledge to be certified as a professional sign language interpreter. With the change of election law, since1995, in order to show their political views, the poll-booked party candidates for the Upper House have become eligible to employ interpreters who have been certified by the Ministry of Health, Labor and Welfare. At long last, the professional recognition of sign language interpreters became incorporated into the Law. However, besides this statement as law, we cannot find any further reference to the lawful application of sign language interpreting on a national level. This is because sign language interpreting has yet to be designated as requiring occupational licensing. Recently, the trend has been that when a certain governmental agency requires an SLI, they seem to hire one from the list of certificated interpreters who passed the SLICE. Nationwide, not only certified interpreters, but also interpreters for the Deaf acting privately and enthusiastic sign learners support and improve the lives of the Deaf. Most of them work part time without any compensation and without any legal back up and therefore have no professional job　status. We sign language interpreters eagerly work toward the elimination of all barriers and disadvantages, which prevent the Deaf from participating in any social activity, and we work toward the realization of the full participation and equality of the Hearing Challenged Community. We believe that by achieving this, all of society benefits. To achieve these ends, we sign language interpreters have decided on the following ethical guidelines pertaining to specialist personnel who cooperate and collaborate with a wide range of people in society. 1 Sign language interpreters respect and defend the fundamental human rights of all mankind. 2 Sign language interpreters make great efforts to take advantage of their professional skills and knowledge so that the hearing-impaired people are able to participate in every activity and occasion positively. 3 Sign language interpreters encourage all related colleagues and organizations to understand the importance of this code of ethics and endeavor for better working conditions. 4 Sign language interpreters maintain confidentiality and do not disclose information they get through the course of their assignment to a third person without the permission of the clients. 5 Sign language interpreters are required to improve and develop their professional skills and knowledge on a continuous basis. 6 Sign language interpreters are required to strictly verify that their skills and knowledge are not used for any invasion of human rights or misused for any antisocial purpose. 7 Sign language interpreters are to involve themselves positively into studies and practices which enhance the system of sign language interpretation and a well-developed training system for the SLI as well. 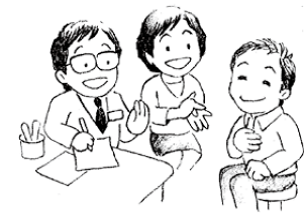 The Japanese Association of Sign Language Interpreters was established for the purpose of improving the quality and professional skills of sign language interpreters(SLI) three years after the first examination for SLI in1989. We have been doing various activities to improve the status of SLI and with the aim of being evaluated as a professional organization for about 20 years. "The Ethical Guidelines of SLI" was established to insure the proper social evaluation of our group. Meanwhile, the number of SLIs has been certainly increasing in spite of many difficulties. SLIs are introduced in the Upper House elections and also in the party political broadcasts for the Lower House in Japan. Due to the wide spread socially recognized importance of including the Deaf in societal participation, Japanese local governments are starting to enlist the services of SLIs. Now their social status has been gradually raising and they are being recognized as playing socially-important roles to realize the participation of the Deaf in society. Achieving the converting of our association into independent corporate entities is no call for us to rest. There are still many problems that must be resolved for SLI to be socially recognized. In order for the license of SLI to be considered as a professional qualification, the title needs to be enshrined into law. For the realization of this aim, we —　the Japanese Association of the SLI —　have to promote the social recognition of the SLI title and lay down our roots as a necessary professional organization in society more than ever.